One of the most annoying types of people you can meet at a party is the guy who tells you a long, unfunny joke and then, when you understandably fail to laugh, tells it to you again, this time explaining it as he goes. And then he explains it again a third time and a fourth until you figure out a way to escape. M. Night Shyamalan does the same thing with his audience in Glass, the eagerly awaited sequel to his surprisingly successful thriller Split. As a result, a promising beginning and an intriguing premise turn into a 21st-century version of the group therapy scenes in One Flew over the Cuckoo’s Nest with a heavily sedated Jack Nicholson. After a lengthy dry spell during which he was responsible for some genuinely dreadful movies, Shyamalan seemed to have regained his footing with Split. It was a well-made but seemingly conventional woman-in-peril thriller about a nutcase named Kevin (James McAvoy) with Dissociative Identity Disorder who kidnaps a group of cheerleaders. But then, in a post-credits scene that stunned those who hadn’t already read about it, the audience learns that an older David Dunn (Bruce Willis), the hero of Shyamalan’s 2000 film Unbreakable, is still alive and looking for Kevin. Unbreakable is one of those movies that is, well, unbreakable, a film that didn’t resonate with critics or audiences when released but has developed a cult reputation since. The central premise of Unbreakable is that David is a real-life superhero, a man who is seemingly impervious to harm and has extraordinary strength and psychic powers to boot (he can read a person’s thoughts by touching them). Shyamalan tried to bridge the gap between the comic book world and the real world, but, unfortunately, audiences in 2000 were looking for The Seventh Sense, not reality TV superheroes. Needless to say, the comic book cinematic landscape has changed dramatically by 2019, and the time would seem to be right for Shyamalan to have David and Kevin do battle. And it would be a battle fit for a comic book, since one of Kevin’s multiple personalities, dubbed the Beast, has extraordinary strength, an extremely brutal disposition, and the ability to walk on ceilings. Further, Shyamalan throws into the mix Elijah Glass (Samuel L. Jackson), the villain from Unbreakable, who is the prototypical criminal genius. Glass does get off to a good start, as David and his son (Spencer Treat Clark, who first played the role as a child in Unbreakable) discover where Kevin is holding his most recent group of captured cheerleaders (Split explained the nature of Kevin’s morbid fascination with women). But before David can subdue Kevin, they are both caught by Dr. Ellie Staple (Sarah Paulson), a psychiatrist who specializes in the treatment of people who are under the delusion that they are superheroes. Her guards then take David and Kevin to her institute, where they learn that Elijah is also a patient. So far, so good. If audiences are willing to accept the premise that individuals like David, Kevin, and Elijah exist, then it’s not too difficult to imagine them eventually winding up in the looney bin, or that one of those typical well-meaning but naïve movie psychiatrists would try to “cure” them. And, of course, well-meaning but naïve movie psychiatrists invariably have security safeguards that wouldn’t stop a group of pre-schoolers from getting out, so what the three inmates eventually do isn’t very hard to guess. I was willing to go along with all of that, as long as the movie delivered a good payoff. But it didn’t. First, Shyamalan either takes Ellie’s faux therapy seriously or is enamored of Sarah Paulson or both, because her character winds up dominating the last two-thirds of the movie, despite the presence of the ordinarily energetic James McAvoy and Samuel L. Jackson. To be fair, McAvoy does carry on just as he did in Split, and it’s a lot of fun watching him switch personalities, sometimes in mid-sentence. However, Shyamalan handcuffs himself unnecessarily by keeping Jackson’s Elijah in a near-catatonic state for the first half hour that he is onscreen. Samuel L. Jackson is one actor you don’t want to leave in a coma in any movie. 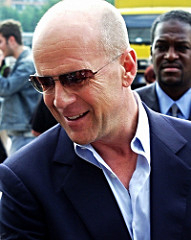 With Jackson in a seemingly vegetative state and Bruce Willis acting like he’s falling asleep, Paulson can dominate virtually every scene in Glass. So, Dr. Ellie talks to her patients and explains to them why they are deluded and talks some more and explains some more. What could (and should) have been accomplished in about five minutes of screen time goes on for nearly an hour, by the end of which many in the audience may feel as if they, too, are in a vegetative state. Eventually, the triumvirate of superheroes (and villains) does escape, and we get a showdown that, as superhero showdowns go, more closely resembles the finale of a WWE Battle Royal than a Marvel movie. Kevin’s Beast looks suitably buff sans shirt when he tangles with Dave, but his hooded adversary could have been anyone (and undoubtedly was a stunt double for the not-so-buff Bruce Willis). The showdown leads to Shyamalan’s expected twist ending, which winds up being a triple twist ending. It’s actually not a bad idea for an ending, and one that fits logically with the ground rules the director already established in Glass, but, like Dr. Ellie’s “treatment” of her patients, it goes on too long, explaining things that the audience has already figured out. You can count me among those who enjoyed Unbreakable when it first came out, and I loved the ending of Split, which tied the two films together. Glass is not a total failure. After all, no movie that allows James McAvoy and Samuel L. Jackson to carry on (even if, in Jackson’s case, it’s only for half the movie) can be a total failure. 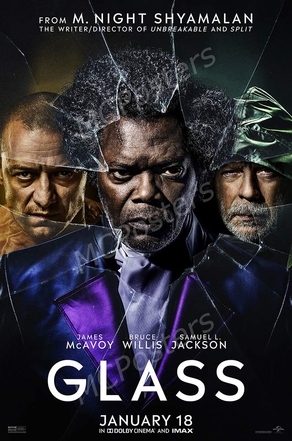 It isn’t Shyamalan’s ideas that go wrong in Glass, but, rather, his execution. This is a movie that needed a good bit more editing of its deadwood psychiatric scenes and extra doses of the inspired lunacy of two of its three superheroes. I do think that the reputation of Glass will rise over the years as more people consider the comic book philosophy aspects of the film as opposed to its technical execution. But, it’s just not at the same level as Unbreakable was and never will be. In this case, it’s merely a glass half full. In this clip, Samuel L. Jackson discusses with James McAvoy escaping the psychiatric institute where they are being held.